The opioid addiction epidemic is the most urgent public health problem facing the United States right now, and doctors need to be more careful with prescriptions so they don't directly addict patients, an expert told governors and officials Friday during the 2018 National Governors Association Summer Meeting. "What we are dealing with is an epidemic of opioid addiction caused by overexposing the US population to this highly addictive drug: prescription opioids," said Andrew Kolodny, co-director of Opioid Policy Research at Brandeis University's Heller School for Social Policy and Management. The forum, "An Evolving Crisis: Combating the Next Wave of Addiction", took place during the annual summer gathering of US governors. 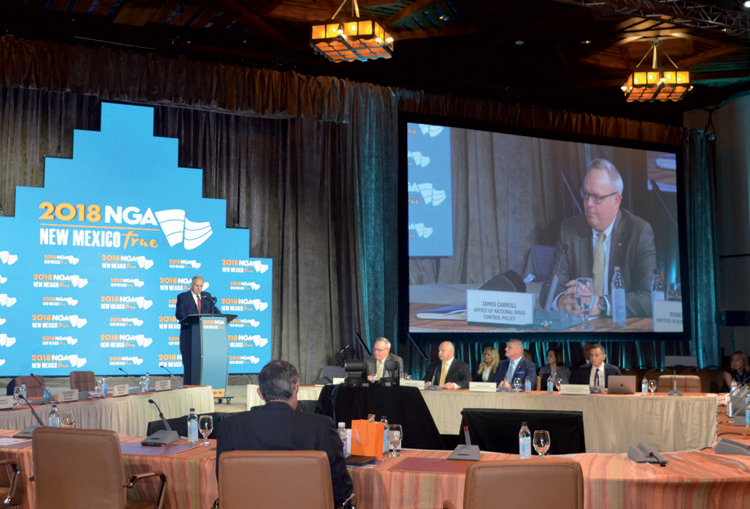 The Centers for Disease and Control and Prevention (CDC) said the US is in the midst of an opioid epidemic, and the fight against the crisis has been a consistent topic during several NGA meetings in recent years. On Oct 26, 2017, US President Donald Trump declared the opioid crisis a national public health emergency under federal law. The CDC reported that opioids, including prescription opioids, heroin and fentanyl, killed more than 42,000 people in 2016, more than any year on record. Forty percent of all opioid overdose deaths involve a prescription opioid. Louisiana Governor John Bel Edwards stressed the importance of coordination by local, state and federal governments in understanding and stopping the drugs from getting into communities. "It's only just the symptom of a larger problem: addiction, and to a bigger extent, the mental health issue, which drive these problems," Edwards said. Kentucky Governor Matt Bevin said there are many simple things that the state and federal governments could do at medical schools and public institutions to tighten regulation of prescription procedures. "Why is there no requirement for licensing purposes for doctors to have better education on a natural prescription process and the effects of these particular types of drugs?" he asked. In an emotional speech, North Dakota first lady Kathryn Helgaas Burgum shared her 16-year struggle with alcohol addiction and encouraged people to show empathy and compassion for those battling addictions. "There's no shame in addiction, and there's so much hope and possibilities in recovery," she told the audience to a standing ovation.